A single word on a Facebook post. As if to say: Wow. Or: What more can I say? So much has been said about this wonderful film and Daniel Day Lewis’ extraordinary presence as Lincoln, a gently humorous, thoughtful and kind strategist. A presence so palpable, it hardly seems a performance at all. But as performance commenters including those under that post suggest, it’s Oscar worthy. Not only is this amendment fundamentally American and a triumph of the human spirit, but it also foreshadows subsequent liberations – the Suffrage movement, Civil rights, The Women’s movement, Gay rights. But sometimes, lack of prior knowledge leads to greater awe. I think that’s true for me with Lincoln. What amazed me most – next to Day-LewisLincoln’s presence – was Spielberg’s vision. The young director, who became famous with a film about sharks circling in the waters off Cape Cod, has in his maturity shaped a film wherein the drama is in negotiation, compromise, back-room deals and argument. Where the climax is a vote in the House of Representatives. Where politics is (almost) a noble activity! Anyway, before I took that swipe at today's obstructionists, I was thinking about Tommy Lee Jones as Thaddeus Stevens, the ardent Abolitionist, and the sharks that try to encircle him, to ensnare him, to lure him overboard with his own emotional rhetoric, his own uncompromising beliefs. New York Congressman Fernando Wood, master manipulator, almost succeeds, but Stevens turns the gotcha moment against tormenter Wood and his colleagues. As he does so, I cheer. Yet as I cheer when Stevens wins the verbal sparring, I am aware that he foils Lincoln who prefers making points by the subtler and folksier method of telling stories and direct appeal to others. No tirade. No put downs. I root for Stevens, but I prefer and admire Lincoln for his reserved, magnanimous methods and choices. Lincoln is the better man. Stevens is a good man too. He may take swipes of his own (who, but Lincoln, can resist being clever?) and give adversaries a tongue lashing, but at least he’s just fighting with words. When men can no longer settle differences in words, they may opt for violence; when that’s groups of men (and now women), that may mean war. Such a war, the cost of anger and rigidity, frames the movie as it did Lincoln’s negotiations in the final months of his life. Lincoln opens with scenes of the gruesome Civil War and near its close revisits a battle-weary world full the dead, the wounded and their severed limbs. Lincoln, however, is not about the war, or violence. Perhaps that’s why Spielberg shields his audience from the event we all know is coming -- Lincoln’s assassination. We don’t need to see it -- so we don't. 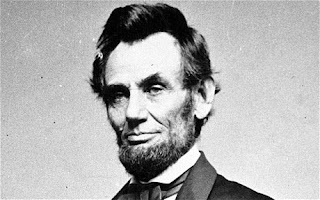 Like Lincoln, Spielberg, the story teller, practices reserve so as not to overpower us with grief for the man we lost, but rather to help us admire Lincoln and what the world gained in four short months nearly 150 years ago. This is lovely, Barbara. You always write insightful reviews. Thank you. I'm currently reading Team of Rivals. Quite good! Haven't seen the movie yet. I probably will not read the book, even though I think I would enjoy it. I am on a fiction kick right now and each time I try to shift to non-fiction, I don't finish the book. So I think I will just stay with my inclination until this pasees. Hi Barbara, I liked your thoughts on Lincoln. I, too, liked the movie and reviewed it at http://www.thecuecard.com/node/737 Daniel Day-Lewis is inspiring in the role!